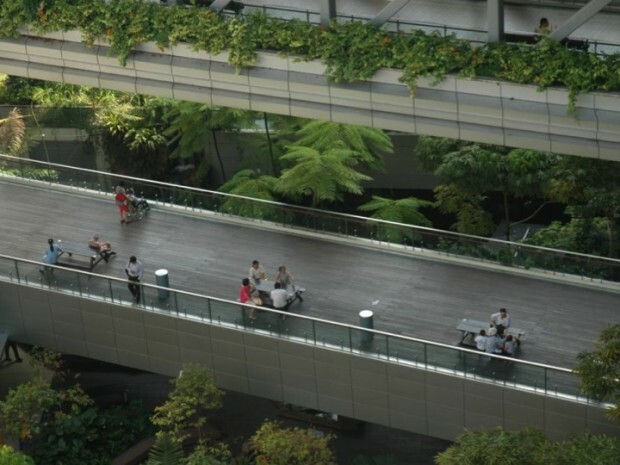 The concept of ‘Biophilic Urbanism’, championed by Tim Beatley and Peter Newman for decades, has been used widely to create more liveable and vibrant cities. This field is about to get a significant boost in activity as the realisation grows that natural features can be used as design elements in cities to help respond to climate change. The concept of biophilic urbanism is inspired by E. O. Wilson’s concept of ‘biophilia’ that suggests we have an innate affinity with nature and that increasing nature in cities can lead to many benefits. Studies show that a connection with nature tends to lead to reductions in depression, anger, tension and fatigue. Having been applied to a number of aspects of psychology and interior design, the concept is now receiving strong interest as an urban design principle, not only for the human well-being benefits, but a range of direct and indirect economic and environmental benefits. Biophilic urbanism has the potential to make significant contributions to a range of national, state and local government policies related to climate change mitigation and adaptation: reducing urban energy consumption, enhancing urban biodiversity, improving resilience to natural disasters, improving worker productivity, and responding to pressures related to densification and revitalisation of cities. Project partners include: Parsons Brinckerhoff, Western Australia Department of Finance, Townsville City Council (CitySolar Program), and PlantUp. A series of stakeholder meetings and discussions have been held along with the facilitation of two stakeholder workshops involving over 25 participants, in Perth and Brisbane. The workshops were based on the methodology of ‘Collective Social Learning’, created by Emeritus Professor Valerie Brown, to guide participants through a process to consider first their vision for a biophilic (nature loving) city and the aspects that enable and disable achieving such vision. Following this a brainstorm was undertaken with each workshop group, to inform the research team’s consideration of the various elements of an economic consideration of both direct and in-direct economic benefits and costs of the use of biophilic elements in cities and other urban areas. The team is mid-way through a case study investigation of key biophilic urbanism examples in Australia and overseas, to consider both the economic and policy considerations that can inform future use of biophilic elements in Australian cities. This investigation is informed through a number of policy and economic analysis related questions that will ensure a consistent evaluation of what is possible and what precedents can inform future development in Australian cities. Reeve, A., Hargroves, K., Desha, C., Newman, P., and el Baghdadi, O. (2013) “Biophilic Urbanism: Harnessing natural elements to enhance the performance of constructed assets” CIB World Building Congress, 5-9 May 2013, Brisbane, Australia. Reeve, A., Hargroves, K., Desha, C., and Newman, P. (2012) “Informing healthy building design with biophilic urbanism design principles: a review and synthesis of current knowledge and research” Healthy Buildings 2012 – 10th International Conference of The International Society of Indoor Air Quality and Climate (ISIAQ), Jul 8-12 2012, Brisbane, Australia: Queensland University of Technology.